Whether you take a ferry from Ribander, Pomburpa or take the long circuitous route via the Calvim bridge, a visit to Chorao Island is just exhilarating. Just driving across the island, watching the beautiful scenery go by, or halting at the famous Salim Ali Bird Sanctuary or the Otters Conservation Centre offer a visitor many things to see & do. And when it comes to eating, we have found Lafayette to ensure that you have plenty to indulge in. Whether you want to start your day with breakfast here or lunch or end it with dinner, Lafayette is pretty much open all day. 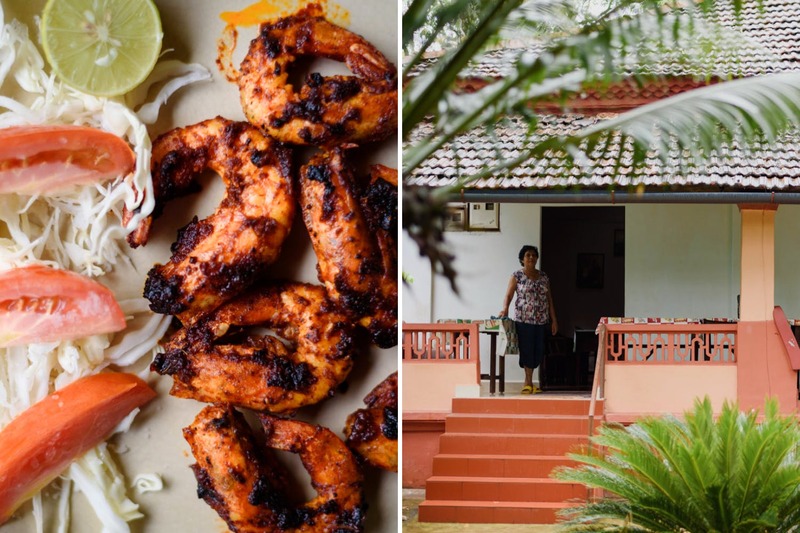 Plus with everything made fresh and in-house, it is for all of you who really want to indulge in yummy & fresh traditional Goan food, without the astronomical prices and the charm of sitting in the balcony of an old Goan home. Fatima Aunty who runs this establishment on her own will welcome you with a smile along with her friendly but shy dog Lassie. It took us back to the days when most restaurants in Goa, were run from homes by locals serving up stuff they made for themselves every day. When we landed there, it seemed like it was already shut for lunch (well we did get lost and landed after 3 pm), but thought would try our luck anyway. What we learnt was that all you need to do is just call out and Fatima Aunty will promptly come out to let you know she’s open (the restaurant is part of her home, so she is always around and hates sending people back hungry, which we love). She opens shop at 8.00 am and takes the last order till 10.00 pm. However, she will let you hang around and finish up until about 11.00 pm. So, we perched ourselves on the table, and ordered some prawns rechaedo & calamari chilly fry, that was perfect with some chilled beer. The chicken cafreal that we ordered next, came with a thick, rich gravy and succulent pieces of chicken, that went perfectly with the fresh poi and rice. Don’t expect a menu, but Aunty will tell you all that is available, including the breakfast menu like eggs, ham, sausages etc. The next time, ditch the fancier places and head to Lafayette for that homely experience. Plus, keep in mind that she is a one-woman Army, dishing up some great food, so just call for that Beer or Feni, sit back and wait for the lovely food to be prepared!